Well, maybe not THAT bad… but it is the first day when the temperatures finally feel like they’re falling. It’s still very windy today… so I took the hubster and the inlaws to the Museum of Natural History. 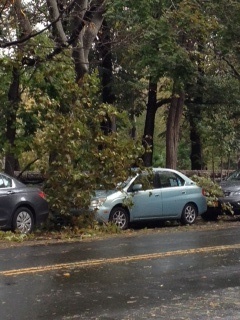 First, I couldn’t believe the size and quantity of trees that had fallen in the park area along 81st Street! Huge trees… but all with incredibly small root balls. I marvel at how they’ve managed to eke out an existence from the rocky landscape that is Manhattan! But all of the upended, cut-down tree, nothing was as incredible as the trunk that’s on display in the Museum! There is a horizontal slab cut from the Mark Twain Redwood in the late 1800’s – they estimate from the rings, that the seedling likely started in 550AD. They just don’t make ’em like that any more! Talk about crazy luck: A very large branch fell from one of the London planes that overhangs the western sidewalk… and the giant “Y” literally straddled a small car that was parked underneath it! How’s THAT for dumb luck? 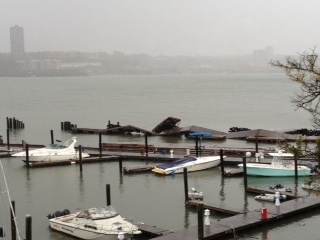 The rain is much harder and more frequent on the back side of Sandy… but the wind is less powerful. The good news for that is that the plants on my roof are getting a nice long drink… but I’m sure it’s not helping other areas of the city (like the subways) that are in danger of flooding! Here’s the observation at 9:30pm: After a day of overcast skies accompanied by humidity and temperatures that are warmer than I expected., I went out tonight to check on my plants on the roof deck and, other than a few arborvitae blown over (which are fine now), I’m happy to report that everything is pretty much as I left them earlier tonight. What I’m also surprised about is that there is relatively little rain falling tonight; I’m sure it’s coming, but I just figured there’d be more by now. Meanwhile, I can say that the individual wind gusts are pretty significant; they’re calling for individual gusts of up to 70 miles per hour. Today I spend a windy, cool day at NYBG (Site Engineering! ), measuring out the north lawn. While waiting for our turn, I noticed that the female ginko biloboas on the side parking lot are LOADED with fruit. I don’t think I’ve ever seen ginkos so completely laden – the branches are bowing significantly and the ground around them is littered with fruit that has already dropped. The male ginkos across the street are just starting to show a yellow edge on their leaves… I wonder how many of the leaves will be left after Sandy’s stay?